The Trump administration’s most notable legislative passage has been the massive tax plan enacted at the behest of its political donors. The tax cuts, heavily skewed to corporations and the wealthy, will cost nearly $2 trillion over the next decade. Now, the Trump administration is resurrecting an old idea: attempting to use authority that has been repeatedly rejected on legal grounds to bypass Congress and give another tax cut that’s even more skewed to the wealthy, estimated to be worth at least $10 billion annually. The goal is to adjust the cost basis of an asset using inflation indexing, so that when the asset’s owner sold the asset, it would reduce the gained amount. This is effectively reducing capital gains taxes. This policy would almost exclusively benefit the wealthy, since they own the bulk of capital assets, such as stocks and other securities and interests in businesses. In fact, 63 percent of the benefit would go to the wealthiest 0.1 percent. Very few middle-class Americans would see any benefit whatsoever. Most Americans only own financial assets through pensions and retirement plans that are tax-favored savings vehicles not subject to capital gains taxes, and home sales have large capital gains exemptions. Tax experts have warned that indexing capital gains taxes without indexing other aspects of the tax code—including interest deductions—would create new loopholes and invite the wealthy to game the system. Even worse, the Trump administration is openly considering the move in violation of the law. During the George H.W. Bush administration, the U.S. Department of the Treasury evaluated implementing capital gains indexing via regulation. However, the Department of Justice’s Office of Legal Counsel determined that the move would have been unlawful, since the law and congressional intent are clear that capital gains taxes should not be indexed for inflation. 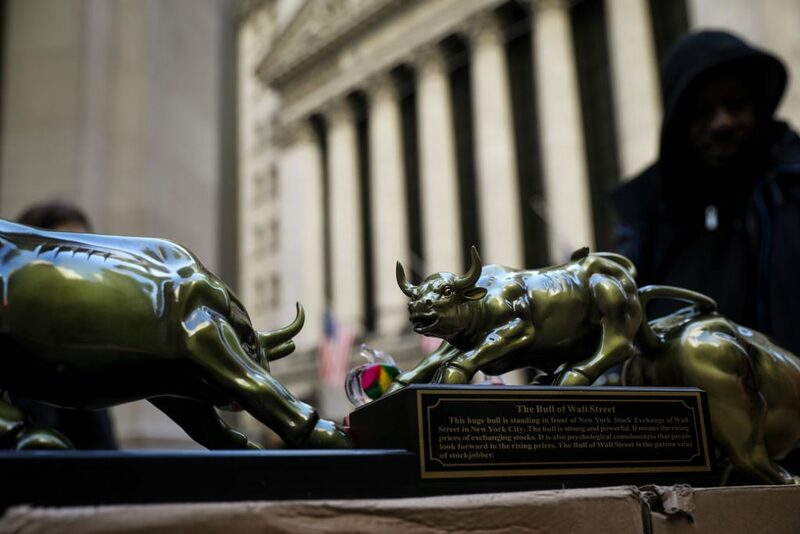 In the intervening years, the legal case for indexing capital gains by regulation has only grown weaker based several decades of legal doctrine, as scholar Daniel Hemel and David Kamin recently detailed. Despite this lack of legal authority, Treasury Secretary Steven Mnuchin and National Economic Council Director Larry Kudlow are reconsidering presidential indexing at the encouragement of conservative groups. Not only would such a move be illegal, it would be a blatant giveaway to the richest Americans at the same time that the Trump administration has been using its authority to hurt workers by rolling back important job protections. 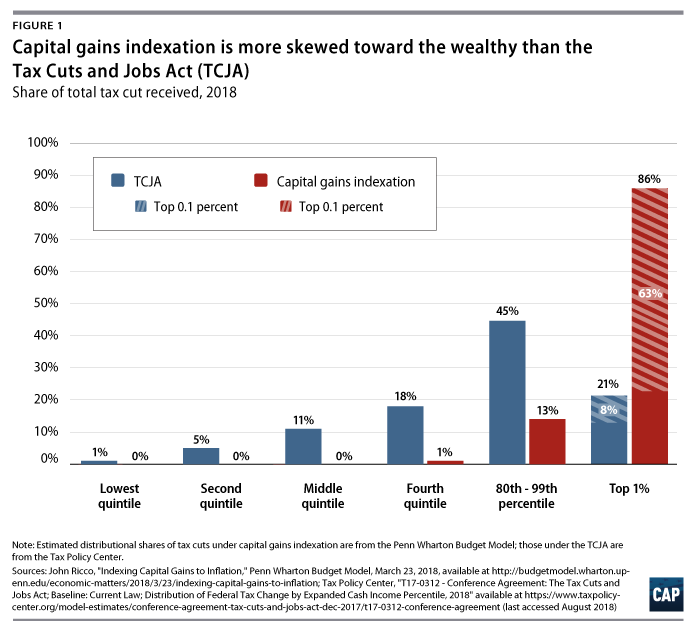 The distribution of benefits from indexing capital gains to inflation is even more skewed toward the rich than the cuts in Tax Cuts and Jobs Act of 2017 (TCJA) as shown in Figure 1. According to a University of Pennsylvania Wharton School analysis, nearly two-thirds of the benefits of indexing capital gains would go directly to the richest 0.1 percent, while only 1 percent of the benefits would go to households in the bottom 80 percent. This is because most working- and middle-class Americans either don’t own capital assets or aren’t subject to the capital gains tax on those they do own. The Tax Policy Center estimates that only 4 percent of taxpayers in the bottom four quintiles will have any positive capital gains income subject to the tax in 2018. Further breaks on capital gains are simply unnecessary. Under current tax policy, income from capital gains already receives preferential treatment over earned income: It faces a lower top rate, is subject to tax only when assets are sold—known as deferral of tax—and, thanks to the stepped-up basis loophole preserved in the TCJA, is completely excluded from income tax when passed to heirs. It is clear that—if anything—Congress should move to equalize the tax treatment of capital gains and ordinary income. Experts have estimate the Treasury proposal would reduce federal revenues—and therefore increase deficits—by about $100 billion to $300 billion over 10 years. This amount of money could completely fund many other policies that would provide real relief to struggling Americans instead of funneling even more back into high-income capital holders. The Tax Policy Center recently analyzed two such proposals: expanding the Child Tax Credit (CTC) and the Earned Income Tax Credit (EITC). Each proposal would cost just more than $95 billion over the course of 10 years, and more than 90 percent of the benefits would go those in the bottom 40 percent of the income distribution. Expanding the CTC alone could give the poorest 20 percent of families—a group that was largely ignored by TCJA—an average tax break worth $1,053. To put the proposal’s cost in context, in 2017, the National Park Service’s budget supported nearly 20,000 full-time employees across 500 parks, trails, and rivers at a cost of $3.6 billion—one-third of the most conservative $10 billion per year cost estimate of capital gains indexing. With an equivalent amount, the U.S. could afford to make serious strides in moving millions of families out of poverty, dramatically reducing hunger, or ending homelessness. For example, the federal government funded an average of 20 million free lunches and 2 million reduce price lunches per school day across nearly 100,000 schools nationwide at a cost of $12.3 billion in 2017. While the Trump administration considers violating the law to further cater to the wealthy, prospects aren’t nearly so promising for everyone else. The U.S. economy continues to grow, but most middle- and working-class Americans still struggle to get ahead. In fact, average hourly wages for production and nonsupervisory workers decreased by 0.2 percent between June 2017 and June 2018. But rather than proposing policies to help workers, the Trump administration has used executive action to cut their pay and retirement savings. For example, President Trump neglected overtime protections for workers. The costs are substantial: Estimates from the Economic Policy Institute suggest workers will lose $1.2 billion in wages each year. Early in his administration, President Trump postponed and declined to defend an Obama administration rule that would have injected transparency into investment advice. Financial advisers currently do not have to provide unbiased information. Instead, they can push products that provide high commissions instead of what is in a client’s best interest. These choices can have considerable long-term effects, as many Americans struggle to save for retirement. In addition, the administration worked to roll back an Obama-era rule that required federal contractors with long histories of wage theft, safety, and discrimination violations to become legally compliant before receiving new contracts. In 2017, Congress and President Trump nixed the rule, again allowing employers with a federal contract—which employ more than one-fifth of the country’s workforce—to break laws and still be awarded business with the federal government. Even if the Treasury decides not to move forward on presidential indexation, conservatives in Congress still hope to legislate indexation of capital gains. In April 2018, Sens. Ted Cruz (R-TX) and James Inhofe (R-OK) introduced a bill to make such changes. Rep. Kevin Brady (R-TX), chair of the House Ways and Means Committee, has also signaled his support for the idea. Unlike the Trump administration, Congress clearly has the authority to pass legislation that would index capital gains. However, doing so would be deeply misguided, especially on the heels of last year’s tax giveaway for the wealthy. Given how the incomes of the wealthiest Americans and everyone else have diverged since 1980, indexing capital gains to inflation would be the wrong step—be it through Congress or illegally via administrative action. Unfortunately, President Trump, his administration, and congressional allies are committed to using the whole of government to make sure that the trend continues. Andrew Schwartz is a policy analyst for economic policy at the Center for American Progress. Galen Hendricks is a special assistant for economic policy at the Center.